I have been spending a lot more time at my computer. I fear I am already feeling some of the health consequences of sitting for hours at a time. I refuse to fall prey to the long-term health problems of sitting behind a computer. 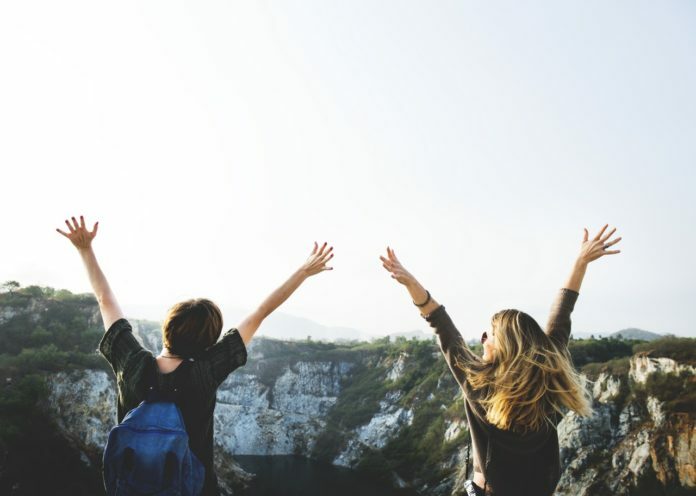 What’s the point of early retirement if you aren’t healthy. Follow these tips to keep the blood pumpin’. If you have the chance skip the elevator. If it’s too many flights then take the elevator only part way. Set a goal over the next 6 months to increase the flights you can comfortably do. Once it gets too easy pack some books in your bag to keep things challenging. Grab a couple Nalgene water bottles and do some arm workouts as you climb the stairs. Wall sits are great for building strength and endurance. Standing with your back against the wall, slowly bend knees and work your feet out from the wall so you look like a chair. These can be really tough at first but stick with them as you will improve quickly. 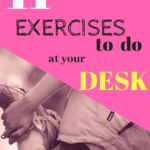 These can be done at your desk without anyone even knowing you’re getting your exercise on. While seated, straighten one or both legs and hold for a few seconds, lower back to ground and repeat. These are great for your core muscles which are important for healthy posture and back stability. Get creative and look around the office for things that you could use as weights. Grab that paper weight and do some curls with it. Dips can be done almost anywhere. Find a stable desk or chair that doesn’t roll. Sit at the very edge and place hands on either side of the body while gripping the edge. Walk your feet out a step or two and get yo’ dip on. Raise your shoulders up towards your ears and hold, 5 seconds should do. Then relax completely and repeat 15 times. Once you get stronger you can do this while holding a paper-weight in each hand. Gold Medal! If getting down on the ground and doing either traditional push-ups or knee push-ups doesn’t feel appropriate. Then try wall push-ups. Place your hands shoulder width apart and step your feet back. As you get stronger you can transition to a lower object like the edge of your desk. If your chair swivels you’re in luck. While seated extend your arms and grasp your table edge. Sit upright with good posture, lift your feet and gently swivel from side to side. Focus on engaging your core. The gold medal move is to roll the chair itself a little to the left and right in addition to the swivel. These can be done anywhere. While sitting, while standing, doesn’t matter. Simply take a deep breath and tighten your abdominal muscles, bringing them inward towards your spine. Squeeze tight and hold for 5-10 seconds. Repeat 15 times. Stuck waiting in line for the copier? Do some calf raises. While standing shoulder width apart, raise your heels up off the ground, hold at the top and repeat. Sculpt those legs for your gold medal podium stand. Don’t forget to just get up and walk. Take the long way to the restroom or say hi to some co-workers on the far end of the office. If you’re really going for the gold consider doing some lunges as you cruise the office. It’s amazing what a little exercise does for your mind and spirit. 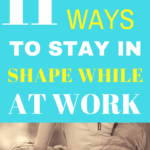 Not only are these exercises good for you but they are great for office productivity. Get other co-workers involved and have some fun with it. Maybe it’s time for the Tuesday wall sit challenge. Gather all your co-workers, line up along the wall, ready set go! Make sure your computer screen is level with your eyes so you aren’t looking down. Prop it up on some books if needed. If you can, consider trading in your traditional chair for a ball chair. They are great for posture and abs. I use the one pictured below and absolutely love it!